Thanks for the express shipping, arrived in four weeks! I love this dress and received so many compliments on my wedding day! Just makes it a bit challenging when wrapping to have pattern always facing outwards. The colours are gorgeous and match the picture very well. I have so many other events to wear this to! Arrived promptly and as expected. I should have allowed a bit more time for figuring out how to wear it and making sure the style I chose would stay put though. There are limited styles you can wear if you want to use a bra with normal straps. Great solution for various body shapes though, and easy to make look good. MillyBridal was very accommodating and fast to resolve the issue. Very quick to respond and to ship goods. Very happy with the final product, they're exactly what i was after for my wedding!! Thanks again for your help MillyBridal. Bought this for a super picky friend that would have bought five dresses to wear to an event. Saved myself days of horrible shopping and the dress has so many options we are able to make her shorter bustier frame look amazing in more than one way! I ordered 6 of these dresses and was very pleased with Millybridal UK communication! They made sure all the measurements were correct. My only issue is that the dress did have quite a bit more material than anticipated, but it's not necessarily a bad thing. Thanks! The bridesmaid dress has offered a perfect material for girls because it gives a feeling of delicateness on wearing. I love this dress, and I like this color and fitting of this dress. I still love it. I feel good about party and my appearance because of my dress. This soft color tone dress has a very different design and this is the reason why I have bought this dress. The design is perfectly. 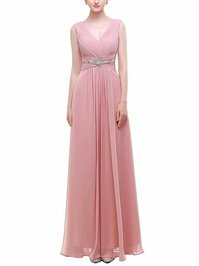 This bridesmaid dress is just amazing in its quality not because of it shine but because of its smooth fabric. I'm very happy with the dress.